As we sat down, I was struck by the unusual way they had set the table. All the utensils were sitting face down on the table, and the butter knives were balanced on their edges. To start, I ordered an iced green tea. It was very refreshing and tasted 10 times better than any pre-processed iced green tea that seems to be everywhere on store shelves nowadays. We were offered a bread basket with a couple of different kinds of bread. Not bad, but nothing memorable. Frankly, I only took the picture because I was trying to figure out the lighting. For appetizers, Mom had the slow braised duck thigh over warm cannellini bean and Arugula salad finished with braising liquid and red wine poached pear. She raved about this dish all night and said she would have been more than happy to have it as her entree, rather than just as an appetizer. I tasted a small piece of the duck and it was very tender. These ones were fried perfectly and did not taste greasy at all. Intellectually, I appreciated the pairing of the ale foam, but at the same time didn’t like the taste of it and ended up scooping about half of it onto the side of the plate. I’m not a big fan of most alcohol tastes, but I think someone who actually likes ale would have loved it. Next was the soup course. 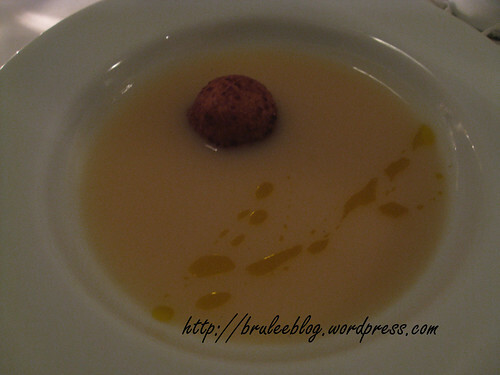 We were served a potato puree soup with cheddar fritter and mustard oil. This was one of the best dishes of the night. It was so smooth but not fatty tasting, and was not oily at all. The cheddar gave the soup a lovely cheesey flavour as well, kind of like eating broccoli and cheese soup but without the broccoli and with a more subtle cheese flavour. At first I thought the mustard oil was superfluous, but when mixed into the rest of the soup it gave the soup a slight mustard tang. This is one of the best soups I’ve had in a while. I wanted so badly to stick my face in the bowl and lap up all the lingering bits of soup. 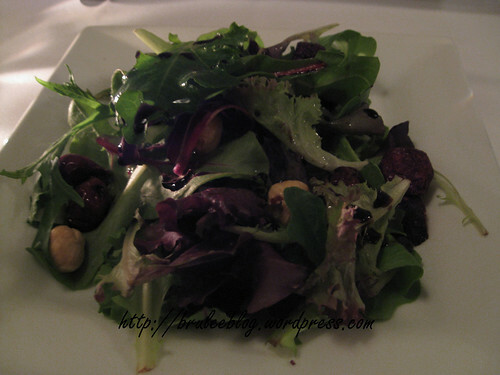 The salad course was a plate of mixed greens with hazelnut oil dressing and dried cherries. The cherries gave the salad a sweet kick. The dressing was mild and nutty, but I found it almost a little too oily. Perhaps the dressing was a little too mild and to make up for that they needed to add more dressing? I’m not sure. 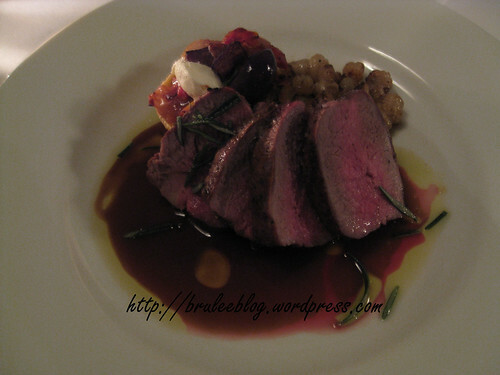 My entree was the grilled lamb loin, ratatouille goat cheese tart and potato, finished with rosemary scented lamb jus & olives. The lamb was cooked until just pink in the centre and was not at all gamey. The ratatouille goat cheese tart had a bunch of vegetables on top and nicely toned down the sharpness of the goat cheese. I was sad when I realized that I had finished everything on the plate already. After all this food, we were stuffed. Dessert was still to come, and we were given a short dessert menu to peruse. 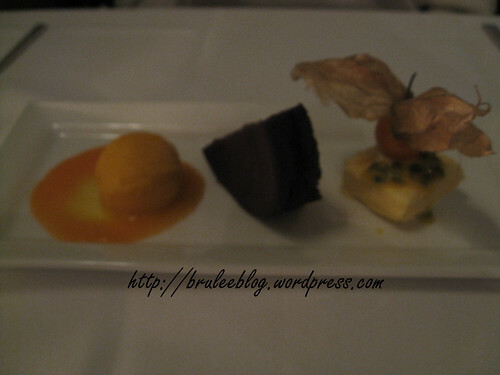 Mom chose a trio of desserts: flourless chocolate cake, papaya coulis and mango sorbet, and a passionfruit cube. 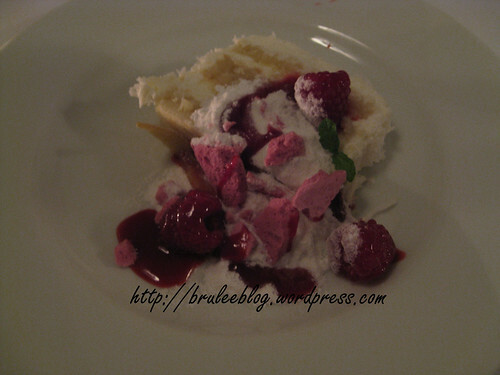 The cake was dense and chocolatly, and the coulis, sorbet and passionfruit were sweet and refreshing. My photo of this is quite blurry; I think I was too tired from all the good food to hold my hand steady. For my dessert, I didn’t want anything too heavy, and eschewed the chocolate for a piece of lemon coconut cake, raspberry meringue crumble, candied lemon peel, and fresh raspberries. The cake and frosting was light and fluffy without being overly sweet, and the meringue crumble was infused with the taste of raspberries. I throughly enjoyed this dessert; it satisfied my sweet tooth and rounded out my meal with a light touch. Other than a couple of minor quibbles, I’d have to say that this meal was practically perfect. 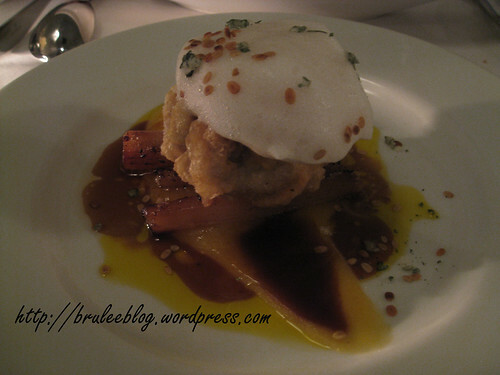 The creativity of the dishes were interesting, the flavours spot on, and the service was outstanding. This is easily one of the best restaurants in Edmonton, and I will definitely be back as soon as my wallet gives me some wiggle room. Superbly described account of what appears to be a very filling meal at one of the most often mentioned “best places to eat” in Edmonton. 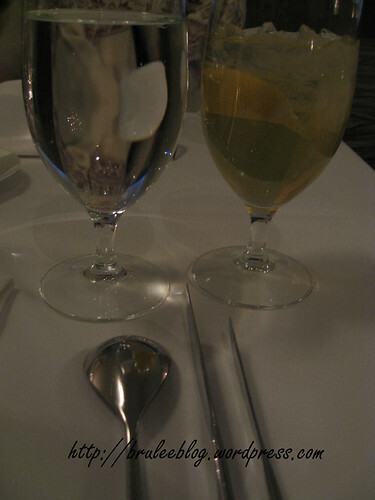 A very interesting table setting with the utensils positioned that way – I don’t think I’ve ever seen that before. 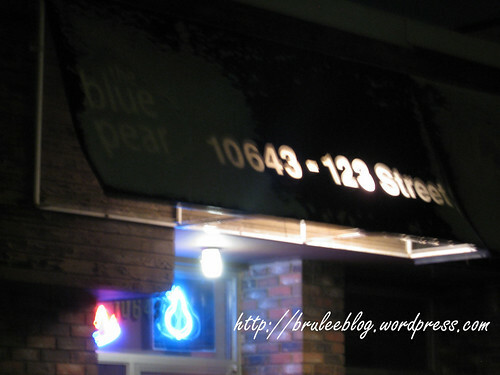 I am curious though, what might have been your other “minor quibbles” of Blue Pear? Just the ones I mentioned in the review – disappointed that the bread didn’t have the wow factor that the rest of the meal did, and the excess oil dressing on the salad. Thank you for such a lovely review. My name is Janice and I work at the Blue Pear. 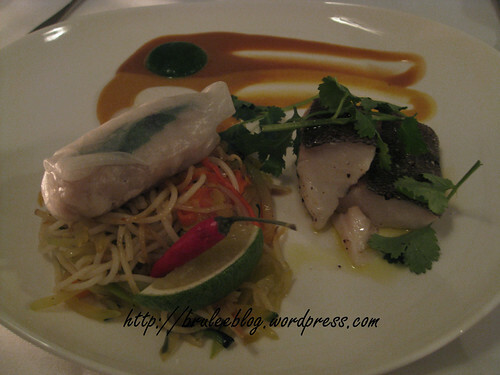 I love the photos that you took and the descriptions of the food are very well done. It is obvious that you are very passionate about food! 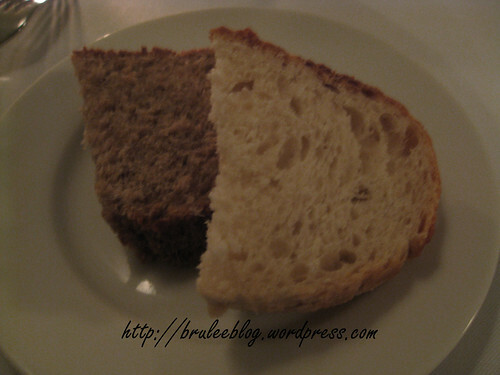 I just wanted to let you know that the bread that we served when you were there was from Treestone Bakery (it is one of the few things that we out-source) and we have recently decided to make our own bread. Our day chef, Bonnie, makes 2 or 3 varieties every day and they are her own recipes. I hope you notice an improvement next time you dine with us! That sounds like my kind of meal!! What a great idea to request it as a present. You get the meal free and your mom gets the perk of eating it with you. Looks fabulous and sounds great, too. Don’t you just love that kind of experience? Every time I have a meal like that (which isn’t often enough) I walk away feeling that everything is right with the world. It’s just heavenly. $85.00 for a five course gig is very well priced. Having had excellent service to boot, I find that is well worth it.